Today.Az - How to plan budget? With the economy still in recovery mode having a budget that actually works is more important than ever. Spending more than you make can be fun for a while, it can be misery-making. There is nothing fun about paying interest on money you have already spent. The good news is that life doesn’t have to be this way. If you have been spending more than you make, you can reverse the process and escape the misery. If you haven’t been overspending and you are simply trying to be pro-active and make a plan to avoid misery, then you are steps ahead. But how do you plan a budget that you’ll actually stick to? The first step to developing a budget is to track your expenses for at least a month, using a Smartphone app computer program, or old-fashioned pen and paper. Be sure to record every purchase, no matter how small. "Once you know where your money is going, you can make an educated decision about how best to allocate your money”, say the experts Instead, learn to moderate. If you're eating out every night, and that's something you enjoy doing, try eating out once a week instead. It's not about cutting out everything that gives you joy in life. It's about better allocating your money. It’s a good idea to record all your recent credit card bills, copies of your household bills, details of your savings and pension contributions and incomes you may have in order to start planning your home budget. Next, you need to add up all your income. Calculate your net income - your regular earnings from employment, as well as, any income you have from savings, investments or rent from properties you own. You need to work out how much you’re spending each month. Look at your bank statements, household bills and credit card bills to ensure you have a realistic idea of where your cash is going – and avoid guessing wherever possible. The more accurate your figures are, the more useful your budget will be. Remember to account for occasional spending, not just monthly expenditures. Think about the cost of Christmas, birthdays, insurance policies and your annual holiday. Add costs like these into your list of expenses. Subtract your annual and monthly expenditure totals from your annual and monthly income figures. You'll be left with the yearly and monthly surpluses – or shortfalls – in your finances. A shortfall will be indicated by a negative number. Meanwhile, if you discover you’re spending more than you earn at the moment, making a budget is a crucial task you shouldn’t put off. If you fail to address the situation, you could drift into debt - and ultimately find yourself in a downward financial spiral that's difficult to escape. 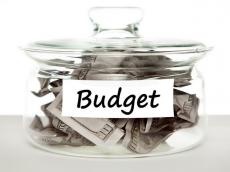 Be as realistic as possible when budget planning. It should consist of what you intend to spend each month, and in some cases each year, on key things. However, there will always be certain costs that are impossible or very difficult to cut. Small changes, such as not buying a takeaway coffee every day, could make a big difference to your budget over the long-term. Once you’ve drawn up your budget, it’s important to keep an eye on how faithfully you’re sticking to it – particularly in the first few months.